It was a warm weekend, and that means the performances started to get rolling. Some big names from the Indoor Season peaked their head Outdoors for the first time, as they ramp up for Invitational Season kicking off on Spring Break. Check out some of the highlights below. The hurdlers in New York State wasted no time in adjusting to the longer distance (and even longer distance). Up at Niskayuna (above tweet), Jessie Parson (New Rochelle) was pushing a strong field, leading with a 14.27 in the 110HH, followed by Josiah Kemp (Colonie) at 14.44 and Corey Anderson (Schenectady) at 14.53. Parson's mark would have been NY #3 at the end of last year, and NY #1 if it had a wind-gauge on it. Meanwhile, down on Long Island, Kenneth Wei (Mt. Sinai) was back as well, dropping a 14.31, edging out Jaheim Dotson (Longwood) at 14.36. It would seem the sprint hurdles in 2019 are a step above those from the year before. Moving to the longer edition, Dotson doubled back with a 54.55 for US #10. But at Cornwall, it was Ryler Gould (Newburgh) putting down a US #4 of 53.94 to take the spotlight over Ryan Curtis (North Rockland) at 54.59. The girls are in the conversation as well, as Chibugo Obichere (Valley Stream South) dropped a 14.12 in 100H last weekend, good for NY #3 the year before. Likewise, Lindsey Butler (Corning) was hitting the long hurdles for a NY #1 with a 62.73 in Johnson City. Indoors seemed to be the year of the jumps, and Outdoors will surely be no different. Dieusi Armand (Westbury) was out on Staten Island clearing 40-0.5, which in any other year, would be major news. But with no wind-gauge, and her having cleared as much indoors, it's just another day at the track for the star athlete. Likewise, Salif Mane (Taft) is skirting 50-0 again, as he hit 49-8 to win the Mayor's Cup at Icahn Stadium. Indoor 3000m Runner-Up Brooke Rauber (Tully) took to the shorter event at her home meet, clocking 2:15.38 for the 800m. That's good for NY #2, after Deanna Martin (Valley Stream South) went out to Arcadia CA to drop a 2:12.98. A little more at home in the 800m is Alex Rizzo (Bronxville), who clocked in a 1:55.15 at the Fulton Invite in Harrison. 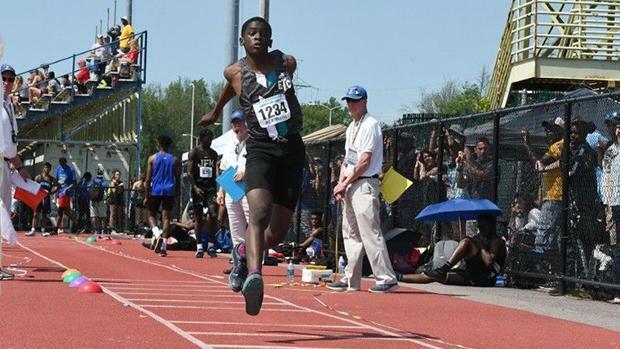 It's the second week in, and Anthony Brodie (Christopher Columbus) has already tied his 400m Personal Best. He ran 47.67 in the Mayor's Cup to win, as well as dropping a 21.63 in the 200m dash, with Chris Balthazar (Fordham Prep) right behind. And again, while there was no wind gauge, Brianna Davis (Brentwood) is coming off a 6th place finish in the Indoor 55m, with a strong debut in the 100m, dipping under and hitting 11.94 at Uniondale.